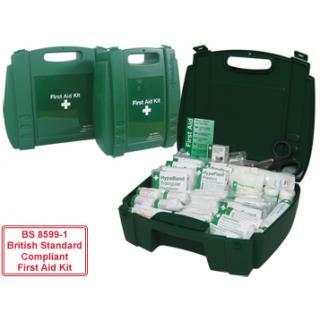 What is different in British Standard Compliant First Aid Kits? ■ Increased number of disposable gloves, which are now required to by nitrile, which eliminate the possibility of latex allergies, whilst being far more dextrous than vinyl gloves. 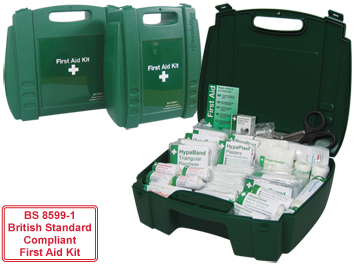 ■ Decreased number of Triangular bandages, as these are no longer used for the immobilisation of limb injuries. ■ Introduction of smaller absorbent wound dressings for finger injuries, where a plaster just will not cope. ■ Introduction of tearable non-woven, hypoallergenic adhesive tape to secure bandages without using safety pins. ■ Introduction of water based sterile gel burn dressings, which do not require any pre-cooling with water and a conforming bandage to secure it. ■ Introduction of clothing cutters, to cut bandages and remove any clothing from around the wound. ■ Introduction of resuscitation face shield, providing a protective barrier for first aiders administering mouth to mouth resuscitation. ■ Introduction of a heat reflecting foil survival blanket, designed to keep the casualty warm in cases of clinical shock or exposure to cold temperatures. ■ Introduction of sterile saline wipes, replacing the alcohol free wipes. These can now be used on broken skin.